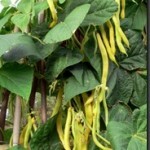 These are not the flat butter beans sold by grocers and imported from warm climates, but varieties of runner, dwarf French and climbing French beans. The pale lemon or yellow pods are stringless and should be cooked whole. Varieties include Mont d’Or (Cumbing French) and Giant Waxpod (runner); Melting Dwarf Wax or Golden Butter and Golden Wax-pod (dwarf French). Cultivation is as for climbing French, runner, and dwarf French, respectively. How to Cultivate Beans. Broad, Dwarf, French or Kidney, Runner.